← WISDOM…One Word, Express In One Hundred Words In One Hundred Days. STEADFASTNESS…One Word, Express In One Hundred Words In One Hundred Days. Steadfastness Activate The Inner Generator That Has The Capability To Create Whatever You Desire. 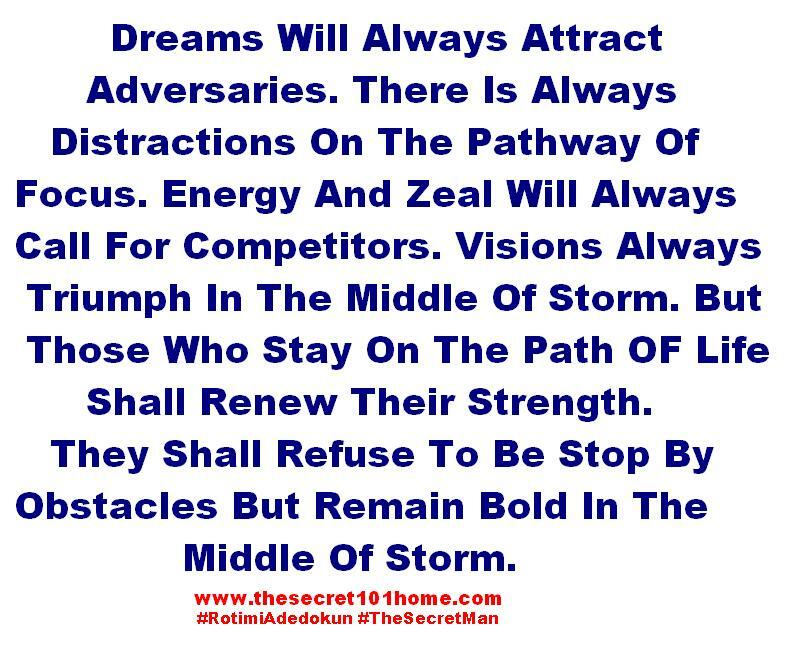 Dreams Will Always Attract Adversaries. There Is Always Distractions On The Pathway Of Focus. Energy And Zeal Will Always Call For Competitors. Visions Always Triumph In The Middle Of Storm. But Those Who Stay On The Path OF Life Shall Renew Their Strength. They Shall Refuse To Be Stop By Obstacles But Remain Bold In The Middle Of Storm. Steadfastness Is The Force Of Life That Create Results. Everything Is Possible If You Quit Not. Remember, Winners Don’t Quit And Quitters Don’t Win. This entry was posted in Life and Time Management, Self Development, The Peace, The Secret, Vitamin Of The Mind, You! and tagged Bishop David Oyedepo, How To be Persistence, Jim Rohn, Middle Of Storm, Pastor E A Adeboye, Steadfastness. Bookmark the permalink.